Yesterday I shared with you what I put in my baby shower baskets (see that post here) and that the biggest tip is planning ahead. What about the times that you cant plan ahead? 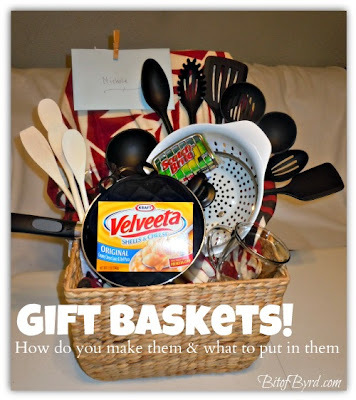 What about baskets for other occasions? My friend Nichole just moved into an apartment and she has stuff... but it is all somewhere else and she cant get it right now. So she is basically moving in with nothing. When you know people who are getting married and don't have things or someone is just starting out this type of basket is perfect. The first thing to think about before planning any basket is to decide to set a spending limit. When it is a good friend or someone I care about and they need a house warming basket I usually set my limit at $100. If they are a friend who already has a lot of stuff or who apartment hops I adjust the limit accordingly. So what can you buy for $100? Where do you get it? Let me show you what I got and I'll tell you why too! - Basket you have to remember to factor in the cost of your basket!!! I was sad to see that most of my items were made in china. But I found this Gem in the rocks. Made in the USA for the win! The first thing to always do when you are giving a gift is to take the time to remove the prices! With gift baskets if some of the items are things I know will not be returned I will remove the tag all together. I removed the tag from the towel, pot holders and the spoons. I did take the wrapping off the pan but I included it in the bottom of the basket in case it needs to be returned. When filling a basket you don't want things to fall in or be out of site. You want the basket to look overflowing. By putting the rolls of paper towels and 2 of the macs in the bottom it creates height and two levels. The towel gets folded in half and acts as a back drop to items on top and a cover to items on bottom. This is what it looks like before filling it. I wish there was a magic way to tell you how to fill it. But there isn't. I had to place items, remove them, replace them about six or more times before I found a way I liked. At first I tried to keep the pan lid on and that didn't work. It is trial and error so don't beat yourself up when everything doesn't fall into place and you have a great basket the first try! I usually try to place big items first. So I placed the pan and the colander first. The cups are in opposite corners. One front and one back. Pot holders are in the pan behind the Mac. The sponge is in it's holder and that is suctioned to the lid so it wont move. Then I fanned out all the utensils. I used a clothes pin for 3 reasons instead of just taping the card or putting it in the basket. 3. the gift receipts are behind the card, so it is holding them too! This gift came in right on budget! A lot of these things are the small things that people often forget about or dont think to ask for but buying them can add up a cost fast. I remember when I moved into my first apartment my cutting board and the wooden spoons I got were my favorite gifts but man buying everything else was expensive!